Obama Names Susan Rice As New National Security Adviser : The Two-Way President Obama has announced his choice of U.N. Ambassador Susan Rice as the next national security adviser, an appointment that does not require Senate confirmation. Congressional Republicans have sharply criticized Rice for erroneous statements she made after the attacks on a U.S. diplomatic post in Benghazi, Libya, last September. President Barack Obama announces a staff shakeup Wednesday, naming U.N. Ambassador Susan Rice (right) to replace the retiring Tom Donilon. 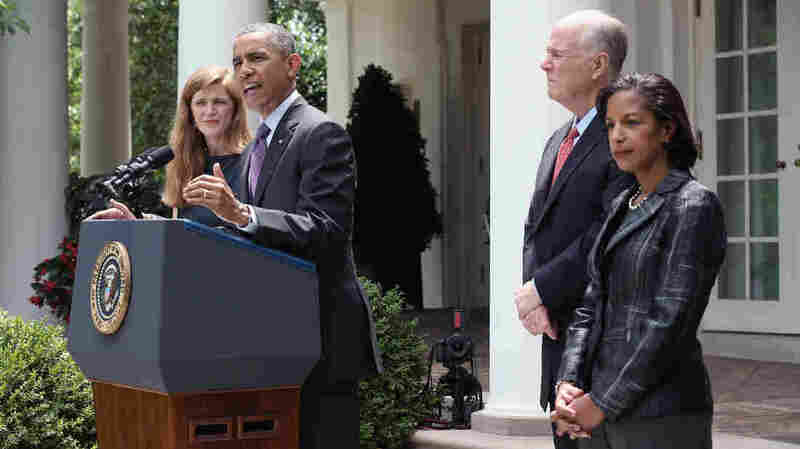 He also nominated former White House aide Samantha Power (left) to succeed Rice at the U.N.
President Obama has announced his choice of U.N. Ambassador Susan Rice as the next national security adviser, an appointment that does not require Senate confirmation. Congressional Republicans have sharply criticized Rice for erroneous statements she made after the attacks on a U.S. diplomatic post in Benghazi, Libya, last September. Calling Rice an "exemplary public servant" and "a trusted adviser," Obama announced the change in the White House Rose Garden alongside Rice and current national security adviser, Tom Donilon, who is stepping down. "Mr. President, thank you so much. I am deeply honored and humbled to serve our country as national security adviser," Rice said at the podium set up for the outdoor event. "We have much to accomplish on behalf of the American people." Donilon's four-year tenure in the post will officially end in early July. Obama credited the political veteran, whose career includes a stint in the Carter administration, for playing a vital role in shaping America's strategy. The event also included Obama's pick to replace Rice at the U.N., former White House aide and author Samantha Power. Rice's promotion is being seen by some as an act of defiance toward conservatives who seized on what she later conceded was an "incorrect" explanation of the Benghazi attack. At November meetings with Sens. Lindsey Graham, John McCain and others in Congress, Rice said the idea that the violence had been part of a mob demonstration originated with the U.S. intelligence community. But after those sessions, Sen. Kelly Ayotte of New Hampshire said she was "more troubled, not less," after speaking with Rice and other officials about the attack. Before that incident, Rice had been seen as a likely successor to Secretary of State Hillary Rodham Clinton. But she withdrew her name from consideration for that post in December, citing what she said would likely be a "lengthy, disruptive and costly" confirmation process in the Senate. Our colleagues at It's All Politics have more analysis of Rice's appointment.